Just a quick update, it’s all been a tad manic these past few weeks – we start previews for the revival of “She Loves Me” tomorrow at the Minerva Theatre for the Chichester Festival. All busy, but it’s looking like a stunning show – the cast, re-orchestrations, set etc. 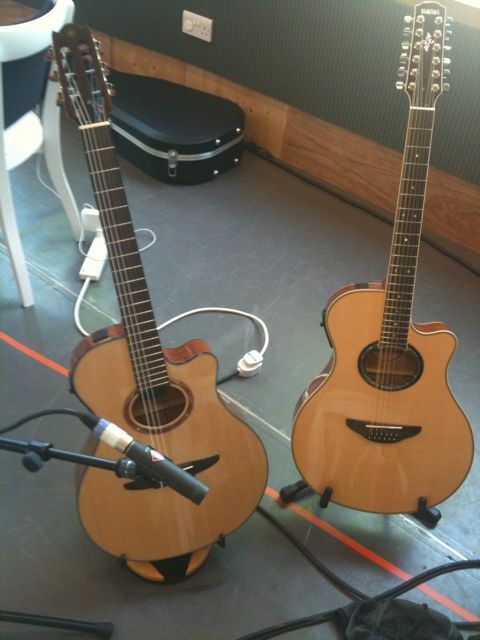 are beautifully done, and it’s a treat to play. Will post more once we kick the run off, but until then you’ll have to rush to get tickets, the run is nearly sold-out! This morning I recorded a cover I’ve wanted to do for a while – it’s my tribute to Gary Moore, his track ‘The Loner’. The guitar world will miss his fantastic & inspiring playing. 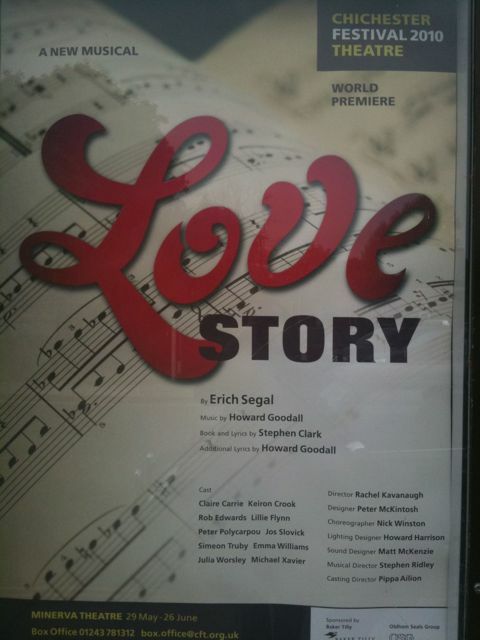 It is with great pride that I can announce the Original London Cast recording of “Love Story” is now available! Currently you can pre-order it at Amazon and Dress Circle, or download it immediately from iTunes here. We had an absolute blast recording the session at the no-introduction-needed Abbey Road studios, worth hearing for that alone! Of course, for the ultimate convenient package, you could come to the Duchess Theatre in the West End and pick up a copy there after seeing the show! It’s official: our limited run will conclude 26th February so please make sure you pop along before then for a chance to see this wonderful show. The chamber music setting makes the guitar chair a delightful challenge, and everyone involved is thrilled to be involved in such a classy, individual show in town. Hope to see you there one last time! …to the show that never ends”, chorus a legion of prog fans around the world. Yes, it’s that time of year where I plug my latest adventures in the pit – June sees me in the guitar chair for the premiere of Howard Goodall’s musical setting of the classic story/film “Love Story” at the prestigious Chichester Festival. It’s a lovely score, for strings, piano & guitar (doubling classical & 12-string) – a wonderful and rare blend of lyrical & evocative writing, with some real finger-twisting ensemble moments. Marvellous! Come on down and revel in the sunshine and musical derring-do! On Green Grass, Silver Linings, Roundabouts and See-Saws. I really can pick snappy titles, can’t I? This latest missive is based around a few observations that keep repeating in my day-to-day existence: the most common being dissatisfaction from friends and colleagues about their professional lot; we all manage to find an example of a schedule that would be perfect if we just had that one thing. I’m sure we can all relate to this: imagine a schedule completely packed to the rafters with gigs – everyday a new challenge, constantly working with different people all over the place. Idyllic, no? I’m sure, as wind-swept musicians we’ve all wanted a timetable a bit like that. But you get stuck in, and after a week, you yearn for the schedule of last month – why, I had so much time to practise! I could really have sorted out that tricky unison passage back then – and you feel encumbered by the workload without any time to yourself to actually get to grips with the material at hand. So the anticipated day arrives – tour over, goodbyes said, farewell drinks imbibed and hastily regretted. A day or two of recuperation allowed to reaclimatise to ‘real life’; then the diary is cleared while the kettle boils, and the excitement is palpable – today is the day! I can finally iron out all the creases in my technique! Sort out my sight-reading! Think of all the transcriptions I can finish – I can master slide guitar now! You change the batteries in your metronome and dig out your music stand. Idealism is a fragile thing, beautiful when young – and it’s always sad to see reality catch up with it, as reality inevitably does. Give it a month. A month of no gigs – of empty calenders; long walks in the park; hours spent practising, preparing for…what? Soon the urge to be back on the stage – treading the boards, rocking the populace – is overwhelming. And we’re into the long, lonely irregular see-saw period. We can find examples of the ‘see-saw period’ in everyday life, not just that of a musician. In relationships, in holidays and travel, in sports training – we crave variety. It’s nice to be social, and surrounded by people – but don’t you sometimes wish you could be alone once in a while? And so the folklore saying ‘the grass is always greener on the other side’ is trotted out with blithe regularity. But it’s not idealism of the alternative that should be encouragement – but instead a regular alternation of activities and situations. It may seem obvious, but the grass won’t always be greener. I’m not saying to avoid striving for greater things – but instead to appreciate the linearity of life. Enjoy the illusive, peripheral nature of the perfect state – and carry on doing your thing, striving to muster all your efforts to doing your task to the best of your abilities. Apply the downward thrust with conviction, and the see-saw will move. Once up, don’t fight it – let gravity take over, and repeat. Don’t stay stranded at the bottom of the arc, moping about missed opportunities. Don’t go searching for the elusive pastures – celebrate the movements of your time on the see-saw. Embrace the differences – they give meaning to what we’d otherwise call the mundane.